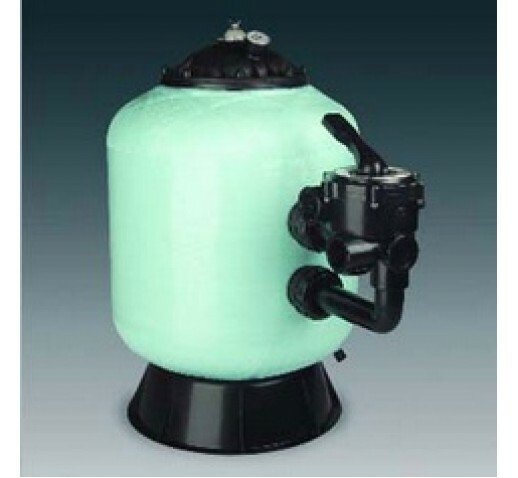 Bobbin-wound sand filters in polyester/fibreglass resin. Cover of Ø 240 with screw closure, die-injected for diameters up to900 mm. Cover of Ø 400 with screw closure, in polyester/fibreglass forØ 1050 and Ø 1200 mm. Blue satin-finish, with dust protection with a clear polyurethane flash coat for Ø 500, Ø 600, Ø 750 and Ø 900. Blue finish for Ø 1050 andØ 1200. Equipped with collectors and diffuser of highly resistant PVC and PP plastic. Side-mount, 6+1 way selector valve for filter, backwash, rinse, recirculate,waste and closed, except for models of Ø 500, Ø 600 and Ø 750. Maximum flow rate: 50 m3/h/m2. Filter base manufactured in plastic with diameter up to 750 mm and polyester and fibreglass for larger diameters. multivalve pool filter ASTRAL SIDE 2.5"